This unique appetizer has a cheese-like flavour and texture. Just put a tofu into miso paste (fermented soya beans paste) and then miso does all the remaining work. You can use any kind of tofu as you prefer. 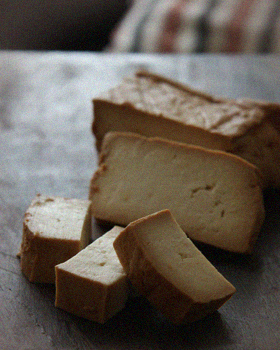 Firm tofu will be something like soft cheddar and soft tofu will be creamier. Also any kind of miso paste. Usually the light coloured miso has sweet and light flavour and dark coloured miso has strong mature flavour. Very easy to make this rich and savory flavoured healthy snack. Suitable for vegans too. Wrap the tofu in a clean tea towel or some layer of kitchen papers, and place a heavy thing (such as a pan) on top of it to force out excess water, then leave it for about 30 minutes. Mix the white miso and the dark miso in a bowl. Spread the 1/3 of the miso mixture into a container, place the dried tofu, and coat all side with the miso mixture, cover and refrigerate for overnight. You can marinate it up to 5 days. The longer marinate the tofu will be saltier. Lightly wipe off any excess miso mixture, cut into bite sized pieces and serve. * The miso mixture can be used 3 times for the marinade. 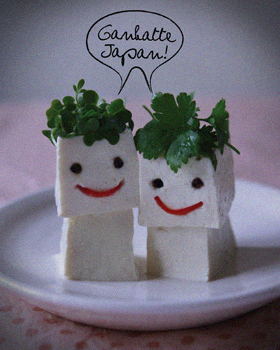 § 3 Responses to Miso Marinated Tofu"
Thank you very much for your warm message, Mario! Yes, they are OK, still having a quite hard time but Japan is going to be fine soon, I hope!! Love this recipe and I absolutely adore the first photo!! So cute! You are currently reading Miso Marinated Tofu at Fish Trip Cafe.